'Cluster analysis' is a class of statistical techniques that can be applied to data that exhibit 'natural' groupings. Cluster analysis sorts through the raw data and groups them into clusters. A cluster is a group of relatively homogeneous cases or observations. Objects in a cluster are similar to each other. They are also dissimilar to objects outside the cluster, particularly objects in other clusters. The diagram below illustrates the results of a survey that studied drinkers' perceptions of spirits (alcohol). Each point represents the results from one respondent. The research indicates there are four clusters in this market. Another example is the vacation travel market. Recent research has identified three clusters or market segments. They are the: 1) The demanders - they want exceptional service and expect to be pampered; 2) The escapists - they want to get away and just relax; 3) The educationalist - they want to see new things, go to museums, go on a safari, or experience new cultures. 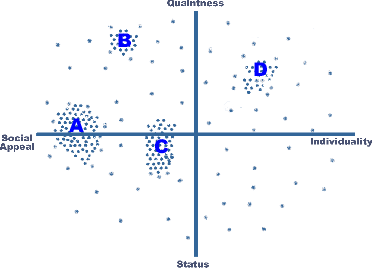 Cluster analysis, like factor analysis and multi dimensional scaling, is an interdependence technique: it makes no distinction between dependent and independent variables. The entire set of interdependent relationships is examined. It is similar to multi dimensional scaling in that both examine inter-object similarity by examining the complete set of interdependent relationships. The difference is that multi dimensional scaling identifies underlying dimensions, while cluster analysis identifies clusters. Cluster analysis is the obverse of factor analysis. Whereas factor analysis reduces the number of variables by grouping them into a smaller set of factors, cluster analysis reduces the number of observations or cases by grouping them into a smaller set of clusters. Optimizing Partitioning method - first a non-hierarchical procedure is run, then objects are reassigned so as to optimize an overall criterion. The Journal of Classification. A publication of the Classification Society of North America that specializes on the mathematical and statistical theory of cluster analysis. Sheppard, A. G. (1996). The sequence of factor analysis and cluster analysis: Differences in segmentation and dimensionality through the use of raw and factor scores. Tourism Analysis, 1(Inaugural Volume), 49-57.